MailPix has all the tools you need including a huge selection of greeting card templates that are designed for a variety of occasions. Create anything from graduation cards with photo layouts to custom wedding invitations. 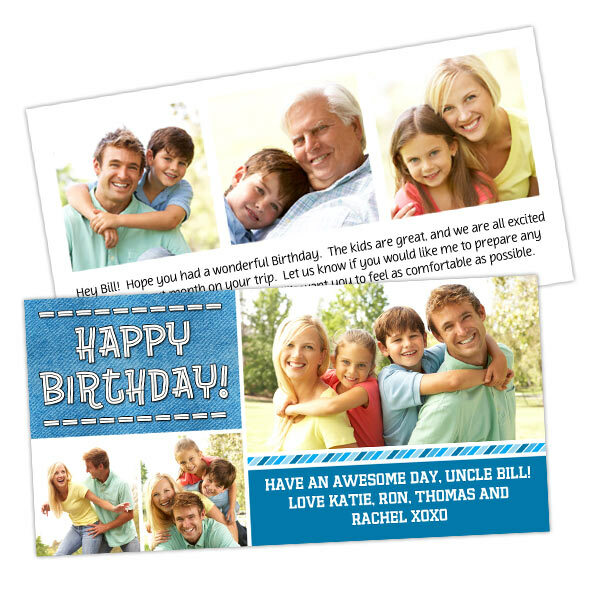 Adding your own photo is a great way to give your greeting a personalized, unique flair that simply can't be beat. All double side cards are printed on premium card stock to give them a professional look that is sure to impress, whether you're designing your own wedding invitations or you simply want to create your own set of thank you notes. Create the perfect announcement for your graduating senior's big day! We offer several stylish custom graduation cards that you can personalize yourself with photos and text! Upload photos from your phone, laptop, Facebook or Instagram to get your design started. With multiple options at your fingertips, you can create the perfect card to make your senior's graduation all the more special. Make Mom's day with a personalized Mother's Day card that features her most cherished memories! From pictures of the family to cute selfies of her kids, you can create a collage of her most treasured moments on the front the with personalized message on the back! Our double sided cards are made from quality card stock so they have that professional look much like store bought cards. In contrast, yours will be fully personalized using your most cherished photographic moments that make Mom smile! Let Dad know how much you care with a personalized greeting that features a cherished memory. Whether it's a picture from last summer's family BBQ, or a favorite camping trip moment, you can use any photo from your collection to create a custom Fathers Day card that is guaranteed to make Dad smile. Furthermore, we have a variety of templates in a range of styles! Just select your pictures, upload them to MailPix, and drop your photos into place to create the perfect Fathers Day greeting. With Father's Day around the corner, you may want to check out our photo gifts in addition to our custom printed greetings! We have dozens of cheap Fathers Day gifts that you can personalize to your liking. Photo gifts are not only unique, but come from the heart. Forego the trip to the mall this year, and create something for Dad that's meaningful and brimming with character!